New gardens need to be planned. Drawings are really useful ways of showing what is intended and giving instructions to contractors. These drawings are made to scale so that accurate quantities of plants and materials can be ordered and structures built where intended. Like many neglected urban gardens, this one was a bit of a wasteland. Long neglected and subjected to the ravages of building works, it was a bleak place. Overlooked and lacking privacy, it felt small, arid and uninviting. 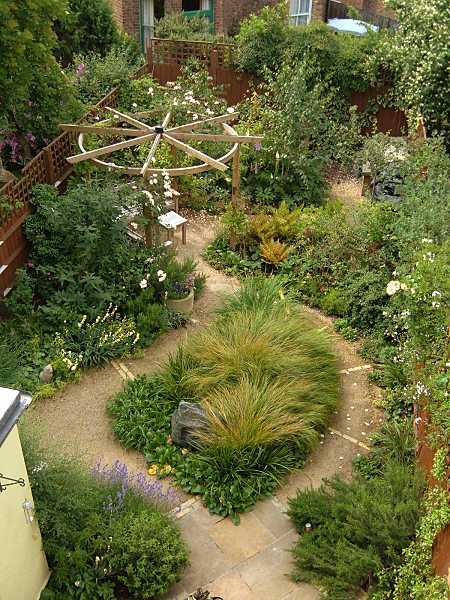 To a garden like this. 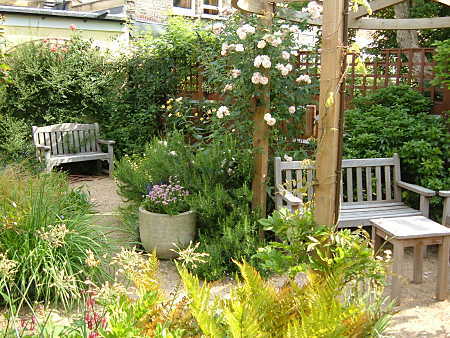 The brief for this garden was to create a garden of contemplation where my clients could retreat and refresh themselves after a day’s work in the city. That meant creating privacy, calm and places to walk and just be. 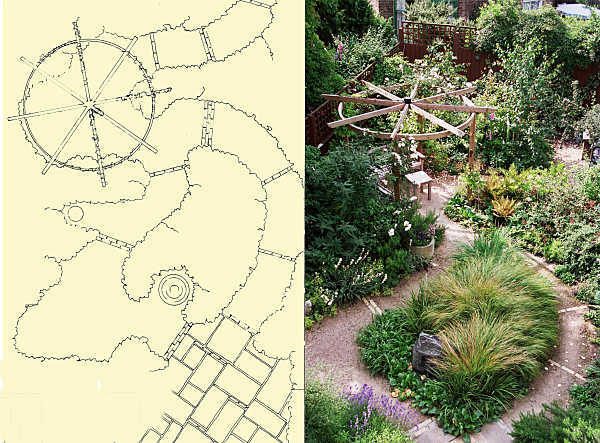 Paths were designed to gently wind past a water feature and through grasses and scented flowers to two secluded seating areas. To make walking in the garden feel close to nature I had the paths made from ‘Breedon Gravel’, a mix of shingle and fine clay particles that bind together to make a firm but natural surface. 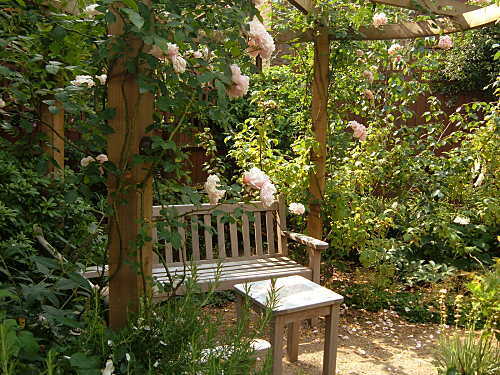 Bricks laid into the paths add interest and rhythm, and the circular nature of the walk is reflected in a circular pergola covered with fragrant roses marking the focal point of the garden. 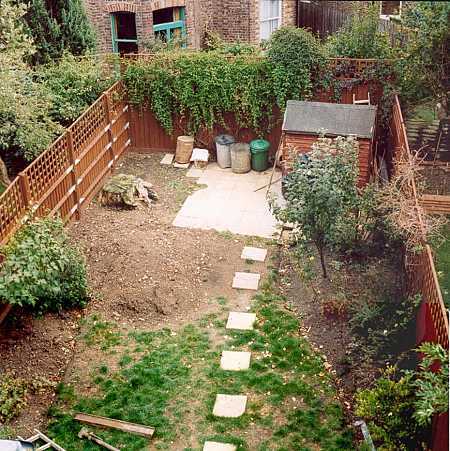 Of course when a garden is first built it looks fairly new and bare. 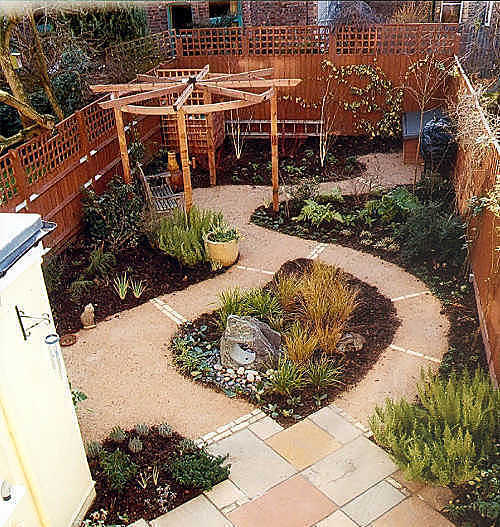 This is the garden immediately after building and planting finished. It’s a mistake to cram the garden full of plants to get an instant effect. All this means is that in a couple of years the plants will start choking each and nothing will grow into it’s full beauty. If you can be patient you get better results and you save money. The garden will soon grow if all the preparations have been done properly. Here’s the garden after two years: roses in full bloom and everything verdant. The measure of a good design is that it works, it grows and it feels like it has always existed.